Volkmann’s Conweigh Vacuum Conveying and Weighing/Dosing Systems measure both incoming and outgoing material flow. Systems can be set to convey a specific amount or simply control the feed rate over time. CONWEIGH does the rest, giving you a vacuum conveyor with coarse and fine dosing function (up to 99.7% / 99.9% precision, depending on material condition). Volkmann Conweigh Systems are built to complement Volkmann’s VS and PPC conveyors, thereby providing a wide range of possible applications. 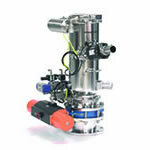 They work gravimetrically with the vacuum conveyor mounted on a special frame, isolated from external forces and loads. The filling weight is constantly measured throughout the suction cycle. The amount of material to be conveyed is specified via touch screen input. Conweigh systems are able to set up recipes for different materials to be picked up from a number of sending stations. Its controls switch the valves to activate the correct transportation line automatically. The Conweigh system is used for dosing weights of 2 kg and above and supports transported material released discontinuously in cycles. The maximum dosing capacity is defined by the transportation capacity of the vacuum conveyor and for Conweigh this is up to 4 t/h. The accuracy of the system is 99-99.7% of the indicated value (configured to customer demands). The special design and assembly offers the advantages of all Volkmann VS and PPC Conveyors (easy accessibility and cleaning). Inquire about special systems, e.g. combinations with loss-in-weight feeders, prepared conveyors in weighing frames for on-site dosing controllers etc.